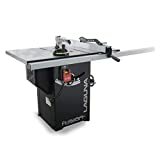 What’s the best hybrid table saw? If you’re looking for woodworking equipment, you’ll probably want to know. 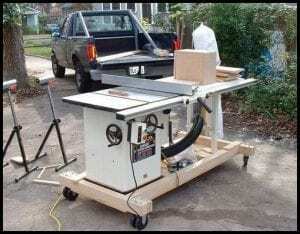 A hybrid table saw is a cross between a cabinet maker’s saw and a contractor’s saw. It combines the protective closed cabinet and power of a cabinet maker’s saw with the affordability of a contractor saw (Source). 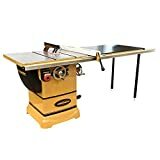 These saws have become extremely popular with hobbyists, since they offer an approximation of a cabinet maker’s saw without the high price tag. Also, while hybrid saws are not designed to be moved around a lot, they are certainly more portable than an old cabinet maker’s saw. A good hybrid table saw needs to be powerful. But it also needs to be durable, safe and easy to use. With all these considerations to keep in mind, it can be tricky to choose the right hybrid table saw for your needs. But take a look at the chart below, and see if we can help you narrow it down. 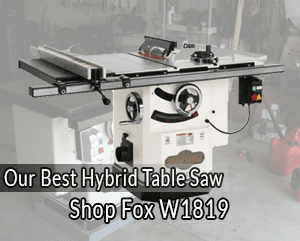 If you forced us to pick THE best hybrid table saw, the Shop Fox W1819 would be it. It’s the perfect combination of quality, power, features, and safety. This saw may have more power than you might need but you never know where your woodworking will take you. The 3HP motor is not common in hybrid table saws, so you’re getting something special here. The cast iron table on this model is large enough for bigger projects and is at a level that is comfortable. You also get a magnetic switch and heavy cast hand wheels. The cast iron trunnions and T-slot miter gauge complete the list of the main features of this model. The Shop Fox also quiet (as far as table saws go) and sturdy. The only thing to keep in mind is that this saw is very heavy and does not move easily. Consider putting it on a moveable base. You’ll definitely need help getting in on the base, though. Not everyone has the luxury of a large garage or workshop. That’s why the Woodtek 159665 has scored in our top 5. It’s the most portability you can get for such a large piece of equipment. The Woodtek weighs in at 220lbs which is relatively light. It also has built-in casters to aid in moving the item out of the way. This is particularly beneficial for hobbyist woodworkers who can’t commit a large, dedicated space to their craft. Although it’s not as big and bulky as some other hybrid table saws, this model doesn’t sacrifice features. It has anti-kickback for safety and a 52″ fence extension for larger projects. This saw is also very durable. It has a paint coat that resists damage from regular use. You won’t have damage from the heat of the motor or weather is you’re using it outside. The Laguna Tools Fusion 36″ is a fantastic choice for anyone’s cutting needs. It is very versatile. The Laguna uses 110V power and has a built-in wheel system for ease of movement. It is not, though, the best choice for heavy-duty jobs or professionals. Just because it isn’t for professionals, doesn’t mean this unit isn’t an excellent choice for at-home hobbyists. The features are abundant, and the price point is quite reasonable. The 1.75HP motor and 10” blade will cut through your weekend projects effortlessly. It’s easy to use and easy to assemble. No special expertise is required. The main difference between the Laguna and other units is that the trunnion is not attached to the tabletop. Instead, it is mounted on the frame like a traditional cabinet saw. The unique trunnion mount means that this saw is more stable and rigid than others. Less vibration and therefore noise is created when it’s in use. The lower vibrations lead to more accurate and steady work. The Powermatic P1000 is a solid choice for any user who values quality, safety, and reliability. It’s not the most powerful hybrid table saw, but with 1.75HP it’s enough to get the job done. At least it can be used on a 115V plug. No special electrical wiring is needed. One of the best safety features on this saw is the hands-free power switch. In a pinch, it can be an accident-saver. It also boasts a tool-less guard assembly with independent side leaves for increased safety. Safety does not come at the expense of other features. The motor is a poly-v belt which reduces vibration and increases efficiency. You get a dust collection hose and a 4” dust port. The blade surround also helps to keep a clear path between the materials and the blade. Expect effortless adjustment with this hybrid table saw due to the miter gauge. Its ability to pivot 60° on either side will come in handy. This saw is also very reliable. It comes with a five-year warranty from the manufacturer and is built with sturdy materials – especially the cast iron work surface. Not everyone can afford to spends lots of money on a hybrid table saw. That’s why we have included this Shop Fox model for anyone where price is the highest concern. It’s a perfect option for any weekend DIY projects you have. The price is low, but the features are high. The focus in this model is definitely on functionality. It will get the job done. It may not be the quietest or the prettiest, but for the money, it’s excellent value. The W1837 is very portable. It’s on the light side and can be moved easily on its two-wheel and kickstand design. It’s easy to run it out of the way when you need the garage for your car. The 4″ dust port helps keep things neat and tidy. You may think that you have to sacrifice power when a low price is a top priority. This isn’t the case with this model. The motor is 2HP. Not the highest on this list but not the lowest either. With the lower price, though, there is a downside. The alignment of this saw can be off. The sliding guide doesn’t always hold square, and the solid top isn’t perfectly flat. First and foremost, you need to know what your intended use of the hybrid table saw will be. Are you a hobbyist? Professional? Or a little bit of both? You need to make sure the saw will cut effectively depending on the materials you most often use. Daily users will usually require more power and flexibility than the occasional user. Just know what you need before you buy. 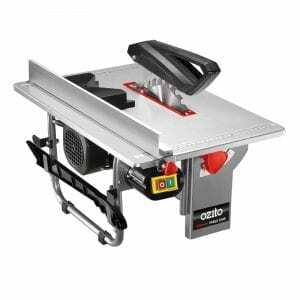 There is a wide range of hybrid table saws on the market at every price point. It’s easy to get drawn in by all the bells and whistles. The best thing to do is set your price limit and stick to it. Hybrid table saws are generally not portable. They can weigh over 500lbs. Carefully consider the area where it will live in your shop or garage because you do not want to re-position it once it’s in. Some hybrids have wheels so if you need to move yours around more than average, think about getting one with this feature. Additionally, if you are considering a hybrid table for only one or two projects, you may want to consider a hybrid table which can collapse, so that it does not take up permanent space in your garage or workshop. The power on hybrid tables saws is not usually an issue for people unless you are cutting thick stock or hardwood regularly. You want at least 1.5HP to avoid lag or motor burnout. Check the plug requirements for your saw too. Some are 110V, and some are 220V. If you opt for the extra power and speed of a 220V model but don’t have a 220V outlet, you may be looking at costly wiring upgrades. Hybrid table saws are designed to cut so obviously they’re very sharp. Safety is always important but even more so if you have kids in your home that could access the saw. You’ll need a padlock and look for a large power button. You want to be able to turn the saw off quickly and easily in an emergency. Good blade guards are also a must – ideally made of steel. Riving knives sit behind the blade and prevent kickback. Since kickback is the number 1 cause of table saw accidents, you can see why this is a crucial safety feature. A good rule of thumb about dust is: the larger the dust port, the better. This is especially true if you are using your saw daily. A dust port 4” or larger is the goal. Some models also come with a dust collection hose. It’s a great way to keep the blade clear in addition to with the blade surround. You can get either a belt drive or direct drive motor. Direct drive motors, as the name implies, are connected directly to the blade. Belt drive motors use a belt and pulley to connect to the blade. Especially if torque is an important factor for you, the belt drive option is the better one. A poorly assembled hybrid table saw can lead to bad cuts and poor results, but it can also lead to injury. Make sure your saw comes with clear and thorough assembly instructions. Ideally, you want a saw that doesn’t require adjustments just to function. Modifications like stabilizing the unit add time, money and may not work right with the machine itself. Your table hybrid table saw should also be incredibly sturdy. If your base is sturdy, your cuts will be more precise. This is because when there are vibrations through your base or shaking of any kind, the blade is much more likely to slip. 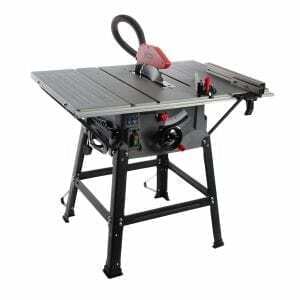 We recommend you purchase a hybrid table saw with a cast iron base. This base prevents the table from shaking and keeps the legs from collapsing. Be careful of hybrid table saw which has supports running between the legs. These are not necessarily a sturdy base, and can still suffer from vibrations and poor cuts. This being said, there are other elements of your base which can increase the sturdiness. If your base has a cabinet, you should purchase one made of steel. The steel provides more support to the structure, as well as providing you with an excellent storage area to keep any supplies you need for your saw. On another hand, if you can’t afford to purchase a base of that heaviness, you can add weights to the legs of your hybrid table saw. These weights are also made of cast iron and provide your table that extra weight in order to prevent vibrations. One additional consideration you should make before purchasing your hybrid table saw is how much power you have available to run your machine. Most table saws require 220 Volts or more. This is the same power required to run an air conditioner, furnace, or other major appliances. If you are working out of your home, you may have to pay a substantial amount of money in order to have an additional electric hookup added to your power box. Consider a hybrid table saw, instead of a regular table saw. Hybrid table saws only require a power supply of 100 Volts. This is the level of a small appliance instead of a large one. We still recommend that you check your breaker box and assess how much power your home can handle. Otherwise, if you are working out of a shop, your hybrid table saw should function very well for you. You should not require additional electric hookups, as most workshops take the number of high voltage plugs and breakers into consideration prior to being built. Once you first figure out what your needs in a hybrid table saw are, then you can really drill down to the individual features you require. Little things like power switches, wheels and voltage can all be easily overlooked if you’re not careful. Any of the hybrid table saws mentioned in this list would be a great addition to your arsenal of tools. The Shop Fox is the best all around saw, but that doesn’t necessarily mean it will be perfect for you. You may need something lower priced or more portable. In any case, the choice is yours. 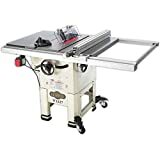 The purchase of a hybrid table saw is a significant investment, no matter which one you choose. Get the best value you can. Take your time, do your research and we’re certain you’ll be happy with the outcome. 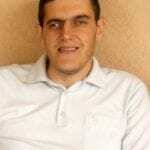 Dragan is an expert Home Improvement writer, with a focus on reviewing power and woodworking tools. Dragan has reviewed anything from hybrid table saws, to drywall screw guns, to bolt extractors. When he's not writing reviews, he spends his free time working on DIY projects at home.